Pietrapertosa is an ancient village that has managed to preserve the medieval appearance especially in the oldest stands characterized by narrow streets and blind alleys under the castle, tha even today mantains the Saracen name "Arabat" . The single-family houses are typically arranged in row from top to bottom. They follow the ground shape to become integral part of the surrounding environment. Often the rock assumes the function of wall inside these houses. Visiting Pietrapertosa you have the feeling that everything is adjusted depending on the rock, for example the many stairs, are examples of the symbiosis between the village, its inhabitants and the rock, the living manifestation of its territory that can not deny the massive presence of nature, that must be part of the urban structure. Pietrapertosa takes its name from Petraperciata, that means"holes" for the presence of a perforated rock from side to side, and is the highest town in the Basilicata, with its altitude of 1088 meters above sea level, spread on the rocks of the Lucanian Dolomites, well protected against incursions from the valley. 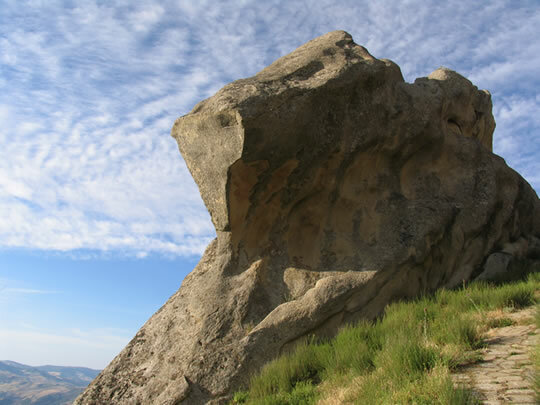 The character of a natural fortress and the position that dominates the Basento valley, have favored the presence of man since immemorial time. The town’s origins are uncertain but the most reliable theories testifies to the fortification, around the fourth century b.C. by the Utiana tribes that occupied the upper and middle valley Basento. We have more reliable information from the tenth century when the fortified village was occupied by Saracens led by Chief Luke, a greek converted to Islam who made numerous raids in the neighboring towns until he was expelled by the intervention of Catapan. The castle was later enlarged by the Normans to ensure a better defense of the place against any intruders. The fortress, which is accessed by a staircase located behind the last houses of the country, is placed directly on the rock and dominates the area of Pietrapertosa. Today, the ancient fortress shows visible portion of the perimeter wall, the entrance arch built with large blocks forming an arch, slightly lowered, a lookout tower and a few slots carved into the rock. At the top there are some steps carved directly on the rock wall, leading to an observatory with an arch formed in the sandstone. Now it seems clear that most of the work of rock excavation should be ascribed to the construction period while the northern side of the castle is an architectural elements related to the fifteenth and sixteenth centuries, the work of successive rulers. 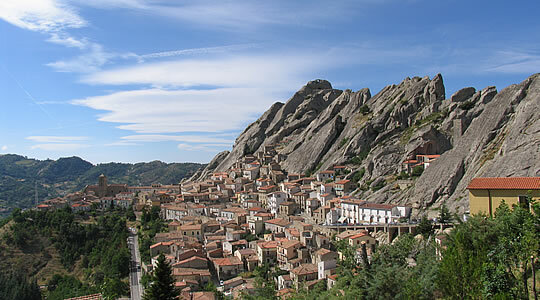 Is strong recommended to the tourist who arrives in Pietrapertosa to visit the castle. From this place you will enjoy the spectacular landscape very hard to describe. The breathtaking view of mountains, forests, sparkling streams and rivers, hills, valleys, which alternate and overlap all around, from the top you can feel the emotion of being suspendend between heaven and earth. 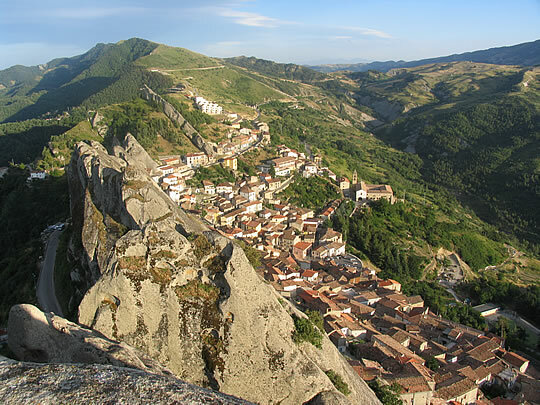 Starting from Pietrapertosa you can experience the exciting Angel flight, flying to the nearby village of Castelmezzano. In June in Pietrapertosa there is "Maggio" Festival. It’s a ritual characteristic of the Park of Gallipoli Cognato and Lucanian Dolomites. The ritual involves the marriage of two trees and coincides with the St. Anthony Feast, one of the most venerated saints of the local community. A tradition of ancient origin linked to the worship of trees that has always represented a symbol of prosperity, strength and peace.